When we think of fine cuisine, Kentucky Fried Chicken may not be the first restaurant that comes to mind. Yet, there is something about their cole slaw that calls for a variety of copy cat recipes that seem to crop up all over the internet. Those that sing KFC cole slaw’s praises cite it as having a unique taste and look that makes it crunch differently in your mouth. This may be part of the reason why it’s the most ordered KFC side dish, taking a generous lead over its runner up, mashed potatoes. Although many have tried to guess the secret behind KFC’s recipe, most say it’s based on the colonel’s decision to have his staff finely chop the cabbage rather than shredding it. 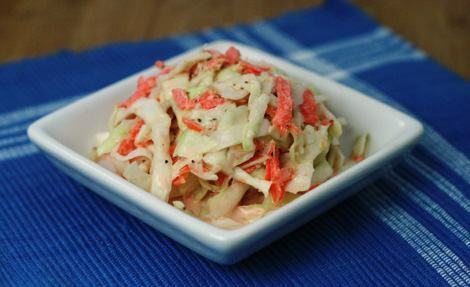 This allows the mayonnaise to cling to the cabbage better making it richer, creamier…and less messy! If you wish you could duplicate that wonderful, crunchy, sweet coleslaw recipe you can only get at your local KFC, this is the recipe for you. It uses buttermilk, sugar and a hint of Tabasco to give it that distinct flavor. And of course, the cabbage is finely chopped! If you don’t have buttermilk on hand, there is an easy substitution; add 1 Tablespoon of white vinegar to 1 cup of milk. Let stand for 5 minutes to let the acid mix with the milk before adding it to the recipe. This recipe is easy to make and comes at a fraction of the cost as compared to KFC prices. It’s a great side for sandwiches, meat dishes and, of course, fried chicken. So, chop some up in your kitchen and find out how you can get that KFC taste right in the comfort of your own home. This one is sure to put a smile on the faces of anyone you serve it to. 1. Slice cabbage paper thin, and toss lightly with sugar and shredded carrots. 2. Sprinkle with salt and pepper. Pour milk over all. Cover and refrigerate for about 15 minutes.